Write a review about your time with Pure Florida and read what others are saying. Visit us on Trip Advisor. Founded in 2009 by Captains Lance and Harry Julian, a father and son team, Pure Florida summarizes five generations of maritime connections. Pure Florida Group, the following job opportunities are currently available. Just wanted to let you know the fireworks cruise last night exceeded my expectations! Your Naples staff did a wonderful job and every details were covered. PURE FLORIDA, PURE FUN & THRILLS! Whether Naples Sightseeing, Spotting Dolphins Or Watching The Sun Set Over The Gulf Of Mexico On M/V Double Sunshine, Catching Big Fish Offshore On M/V Lady Brett Or M/V Kudu Or Calm Bay On M/V Naples Explorer Or M/V Kudu 11, Riding The Waves On Jet Skis, Quietly Making Your Own Pace Along The Gordon River & Naples Bay With Your Private Rental Boat Or Experiencing The Excitement Of The Jet Boat Odin..... 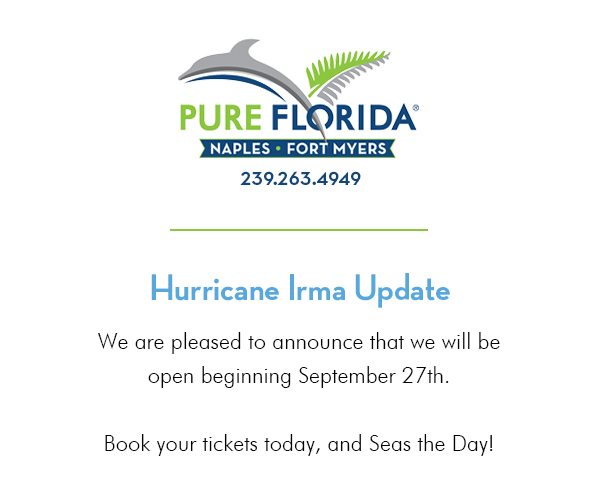 Pure Florida’s Naples Location Is Pure Family Fun & Thrills!